Following the 1 litre of cream I used for the eclairs (It wasn’t the entire bottle!) I grabbed the opportunity to try making my own butter. Yes, butter is made with cream. In my youth I imagined fermenting bubbling cream, and maidens churning for hours in giant wooden vats. Clearly I didn’t have the faintest idea how butter was actually made. After googling ‘what to do with over-whipped cream?’ a long while ago, my chubby milk maiden fantasy was laid to rest. So that’s how you make butter! 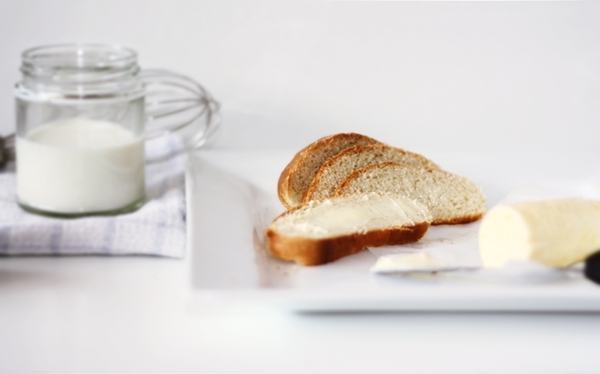 I had a epiphany and imagined making fresh butter every morning with home made crusty rolls and sunlight streaming through the window. Turns out its not very cost effective to make your own butter, I’m not really that enthusiastic, and I never have cream left over. That stuff gets poured on whatever I’m eating. So my butter dreams were laid to rest until now. Its extremely easy to make, and doesn’t need a recipe. Although I suppose that instructions might help. Whisk the cream in the mixer on medium-high. The cream will pass the lovely whipped stage and start to curdle. Buttermilk will separate from the fat solids, its a white translucent colour. Tip it. Add some ice cubes to the mixture to help get rid of liquid and keep the butter cool. When your happy with the texture of the butter, pat it dry with some kitchen towel and add salt (or herbs) if you want. Shape the butter and wrap it in cling film or baking paper. Will keep in the fridge for a week, or maybe longer. I served mine with some soft home made bread rolls I made the day before. Whilst I wont be churning my own butter for my cakes, it’s one of those things to do every so often, and at least have a go once.